Joining the Greater Zephyrhills Chamber of Commerce brings you in direct contact with the area market, potential clients, businesses and extended partners and community organizations. Credibility, networking, affordable advertising and access to services and programs are the primary reasons member organizations join. Return on investment, many times over, is the reason they stay. Membership Plaque to display at your business representing your commitment to quality service and the Greater Zephyrhills community. Zephyrhills Community Profile and Membership Directory Listing published and distributed in Print, On-line and Smart Phone Versions. These materials are widely distributed to newcomers, visitors, at trade shows, community events, and at hotel, hospital, and business lobbies. Website Search Engine Listing: Your business contact information and a map to your location of business will come up when clients are looking for you by product or service category or by name. 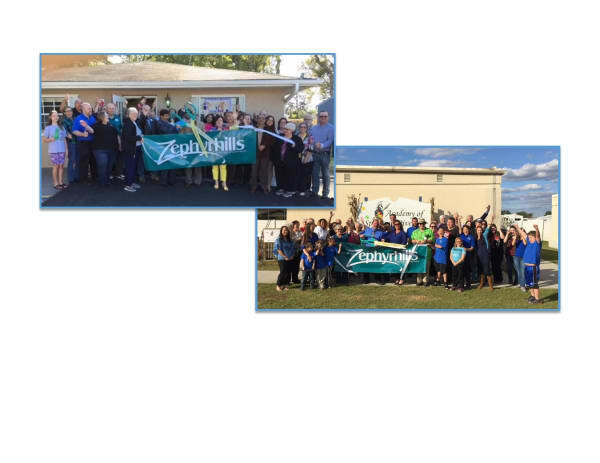 Zephyrhills Visitors Center Presence: The Chamber office is Zephyrhills' Welcome Center. It is the first place of inquiry for many visitors, newcomers and local residents. As a Chamber member you are guaranteed a space in our Brochure and Business Card Displays, the first place our visitors are directed if they are looking for services and products. Exclusive Member Referrals: 12,000 inquiries a year. And we refer exclusively to chamber members. Just one client sent your way, pays for your annual dues. And our Chamber members support other chamber members. You will find they call on you for your services and products. Networking: Entry to all chamber events for you and your guest provides you an opportunity to build relationships. The Chamber organizes monthly Business Breakfasts, Mixers, Chamber After Hours, and Women in the Know...our newest professional networking group organized by women and working for women in their leadership roles. Informative speakers and enjoyable networking make these events worth your time, and your membership. Access: You will have direct access to the services and programs of the chamber's partner organizations - Small Business Development Center, Pasco Enterprise Network (PEN), Pasco-Hernando Community College, SCORE and other professional consulting services. We can set you up for success. Grand Openings and Ribbon Cuttings: Your chamber staff will help set the date, support and guide you to a successful event. Electronic Newsletter: The chamber publishes a monthly electronic newsletter with current information about local events, businesses, economic development and membership programs and services to keep you informed and connected. E-newsletters are e-mailed directly to you and provided year-round on the chamber website. Chamber E-Commerce Email List: Simply register your email and receive regular community and chamber updates. Advertising: Just for signing on as a member, and every year that you renew, you will receive either a complimentary email blast to the chamber's e-commerce listing, or a complimentary full-page e-newsletter advertisement. You are also given the most affordable and exclusive rates all year round for these and other avenues of advertising offered by the chamber. Member 2 Member Discounts: Members support members through familiarity with one another's products and services. Job Postings: As a service to members, the Chamber advertises open positions free of charge. Seminars and Workshops: Free or discounted admission to all chamber sponsored professional and workforce development programs.